A great addition to your Harry Potter celebrations, this Butter Beer will take you away to the Hog's Head Pub, making your party exceptional. For the Butter Beer drop the extracts into the 2 liter bottle, put the cap on and slowly rotate until combined. For the cream topping add all the items together in an electric mixer and combine until smooth and fluffy. 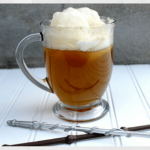 Pore the butter beer into glass cups (clear are the best) and put a dollop of the cream on top and ENJOY! Those wands look so so awesome! LOVE it! I had no idea Harry Potter day was May 2nd! THanks for the heads up – I’ll be making Butter Beer super soon! We LOVE Harry Potter at our house. Fun idea to have a Harry Potter party to celebrate the downfall of you know who! Definitely doing this next year! Jenny, no need to wait. Pick a day and Have a party:) I hope you have great fun whenever you celebrate:) Thanks for stopping by.